Ona Jonaityte is recognized for her “exceptional talent, poise and drive, as well as technical achievement and the ability to communicate devotion to flute music through performance”. Currently, she is piccolo player with the Indian Hill Symphony and a member of Vento Chiaro Woodwind Quintet. She has performed with various orchestras, including Boston Symphony, Detroit Symphony, New World Symphony, Lexington Symphony and Boston Lyric Opera. Ona is a first prizewinner of 27th James Pappoutsakis Competition, YAMAHA Woodwind Competition, and International Juodkrante Flute Competition. Since 2009 Jonaityte has been teaching and performing at The Boston University Tanglewood Institute. 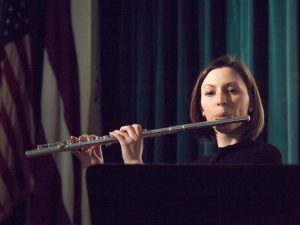 She is a President of the James Pappoutsakis Memorial Flute Fund and the faculty at Brimmer and May School and Sherwood Middle School.